1.2 New York City and Washington, D.C. In 1840, one of his paintings attracted attention and procured him several orders, which enabled him to go to the Kunstakademie Düsseldorf. Due to his anti-academic attitude, he studied only one year at the academy (in the class of Director Schadow). Mainly Leutze was affected by the painter Lessing. In 1842 he went to Munich, studying the works of Cornelius and Kaulbach, and, while there, finished his Columbus before the Queen. The following year he visited Venice and Rome, making studies from Titian and Michelangelo. His first work, Columbus before the Council of Salamanca was purchased by the Düsseldorf Art Union. A companion picture, Columbus in Chains, procured him the gold medal of the Brussels Art Exhibition, and was subsequently purchased by the Art Union in New York; it was the basis of the 1893 $2 Columbian Issue stamp. In 1845, after a tour in Italy, he returned to Düsseldorf, marrying Juliane Lottner and making his home there for 14 years. During his years in Düsseldorf, he was a resource for visiting Americans: he found them places to live and work, provided introductions, and emotional and even financial support. For many years, he was the president of the Düsseldorf Artists' Association; in 1848, he was an early promoter of the "Malkasten" art association; and in 1857, he led the call for a gathering of artists which led to the founding of the Allgemeine deutsche Kunstgenossenschaft. A strong supporter of Europe's Revolutions of 1848, Leutze decided to paint an image that would encourage Europe's liberal reformers with the example of the American Revolution. Using American tourists and art students as models and assistants, Leutze finished a first version of Washington Crossing the Delaware in 1850. Just after it was completed, the first version was damaged by fire in his studio, subsequently restored, and acquired by the Kunsthalle Bremen. On September 5, 1942, during World War II, it was destroyed in a bombing raid by the Allied forces. The second painting, a replica of the first, only larger, was ordered 1850 by the Parisian art trader Adolphe Goupil for his New York branch and placed on exhibition on Broadway in October 1851. It is owned by the Metropolitan Museum of Art in New York. In 1854, Leutze finished his depiction of the Battle of Monmouth, "Washington rallying the troops at Monmouth," commissioned by an important Leutze patron, banker David Leavitt of New York City and Great Barrington, Massachusetts. Late in life, he became a member of the National Academy of Design. He was also a member of the Union League Club of New York, which has a number of his paintings. At age 52, he died in Washington, D.C. of heatstroke. He was interred at Glenwood Cemetery. At the time of his death, a painting, The Emancipation of the Slaves, was in preparation. ^ According to one art critic. 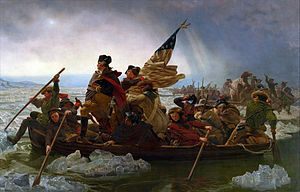 minor historical inaccuracies in Leutze's painting include the Betsy Ross flag, which was created about one year after the event; soldiers used a different type of boat for the crossing; and Washington is depicted older than he was at the time of the crossing at age 44. The soldiers' uniforms are accurately depicted, and the painting correctly conveys colonial unity and pride. The official United States flag was adopted by Congress on June 14, 1777. ^ Marter, Joan M. (2011). The Grove Encyclopedia of American Art. Oxford University Press. p. 144. ISBN 978-0-19-533579-8. ^ a b c d Wilson, J. G.; Fiske, J., eds. (1892). "Leutze, Emanuel" . Appletons' Cyclopædia of American Biography. New York: D. Appleton. ^ a b c Witthoft, Brucia; et al. (1982). American Artists in Düsseldorf: 1840–1865. Framingham, Massachusetts: Danforth Museum. pp. 14, 32. ^ a b Groseclose, Barbara (1999). "Leutze, Emanuel Gottlieb". American National Biography. New York: Oxford University Press. ^ Wolfgang Müller von Königswinter: Düsseldorfer Künstler aus den letzten fünfundzwanzig Jahren. 1854, S. 139. ^ Preble 1880, p. 259. ^ Barratt, Carrie Rebora (2011). Washington Crossing the Delaware. Restoring an American Masterpiece. MET publications. S. 7. ^ Downes, William Howe (1933). "Leutze, Emanuel". Dictionary of American Biography. New York: Charles Scribner's Sons. ^ Heiderstadt, Dorothy (1970). Painters of America. New York: D. McKay Co. p. 88. ^ Metcalfe, Peter M., ed. (1991). "History, State Designations and Superlatives". Alaska Blue Book (Tenth ed.). Juneau: Alaska Department of Education, Division of State Libraries, Archives and Museums. p. 227. ^ Harrington, Peter. "Emanuel Leutze's Portrait of General Ambrose Burnside at Antietam". Brown University Library. Retrieved 8 May 2015. "Leutze, Emanuel" . New International Encyclopedia. 1905. "Leutze, Emanuel" . Collier's New Encyclopedia. 1921.